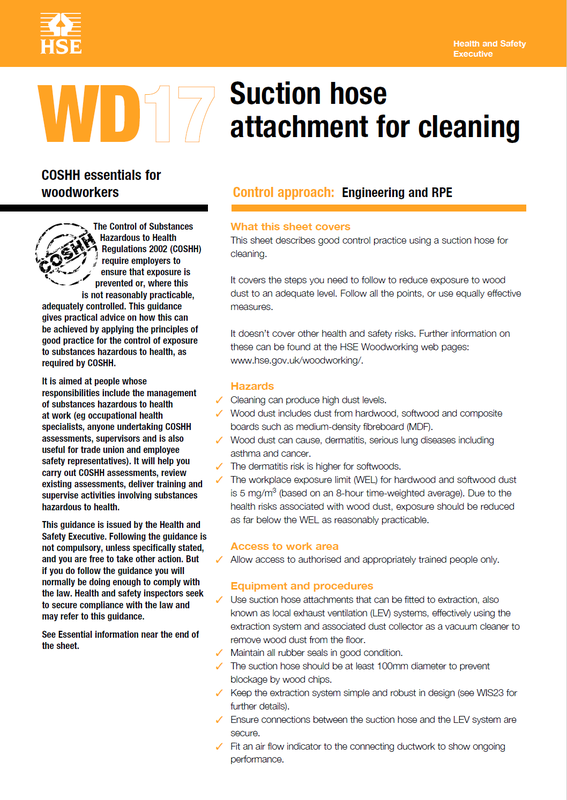 This information will help employers, the self employed and franchisees to comply with the Control of Substances Hazardous to Health Regulations 2002 (COSHH), as amended, to control exposure to wood dusts, etc, and protect workers health. 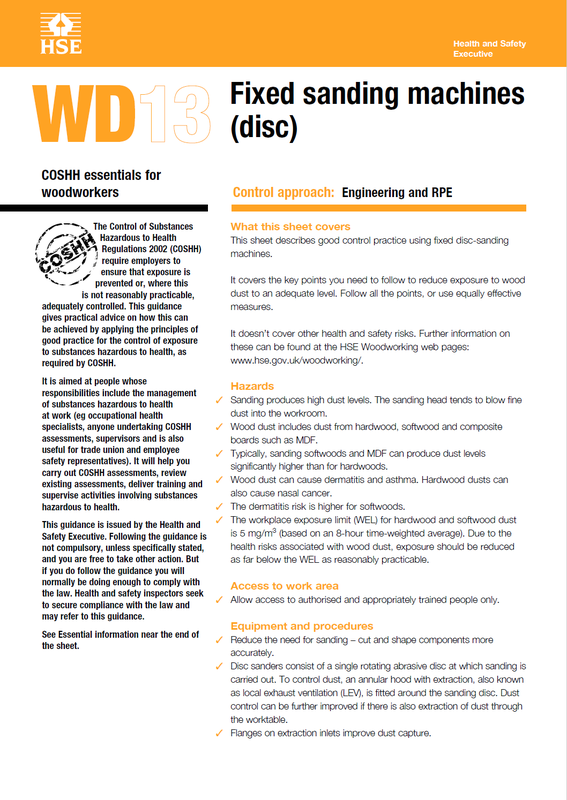 Advice for managersThis information will help managers comply with the Control of Substances Hazardous to Health Regulations 2002 (COSHH), as amended, to control exposure to wood dusts and protect workers’ health. BandsawsThe sheet is part of HSE guidance COSHH essentials: easy steps to control chemicals. It describes the key points you need to follow to help reduce exposure to an adequate level. It is important to follow all the points, or use equally effective measures. Circular bench sawsThe sheet is part of HSE guidance COSHH essentials: easy steps to control chemicals. It describes the key points you need to follow to help reduce exposure to an adequate level. It is important to follow all the points, or use equally effective measures. Cross-cut sawsThe sheet is part of HSE guidance COSHH essentials: easy steps to control chemicals. It describes the key points you need to follow to help reduce exposure to an adequate level. It is important to follow all the points, or use equally effective measures. Vertical spindle mouldersThe sheet is part of HSE guidance COSHH essentials: easy steps to control chemicals. It describes the key points you need to follow to help reduce exposure to an adequate level. It is important to follow all the points, or use equally effective measures. Overhead and CNC routersThe sheet is part of HSE guidance COSHH essentials: easy steps to control chemicals. It describes the key points you need to follow to help reduce exposure to an adequate level. It is important to follow all the points, or use equally effective measures. Hand-held sanding machinesThe sheet is part of HSE guidance COSHH essentials: easy steps to control chemicals. It describes the key points you need to follow to help reduce exposure to an adequate level. It is important to follow all the points, or use equally effective measures. 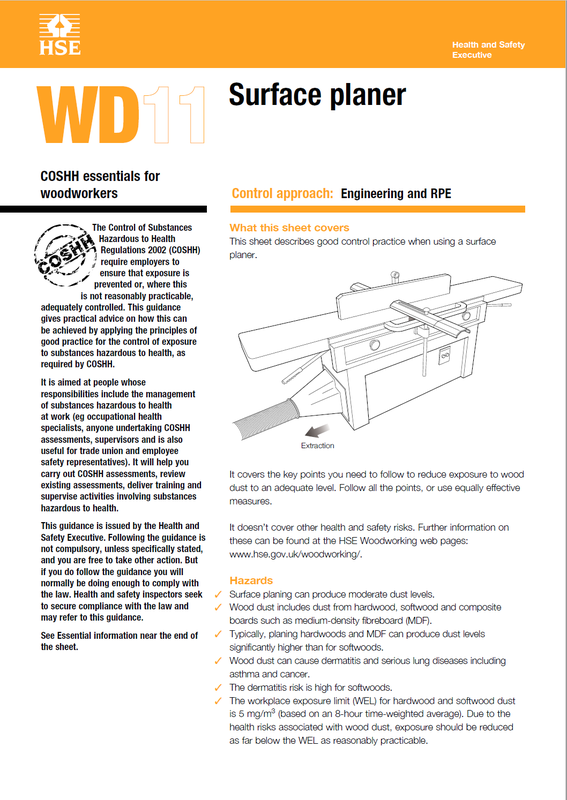 Wall sawThe sheet is part of HSE guidance COSHH essentials: easy steps to control chemicals. It describes the key points you need to follow to help reduce exposure to an adequate level. It is important to follow all the points, or use equally effective measures. Surface planerThe sheet is part of HSE guidance COSHH essentials: easy steps to control chemicals. It describes the key points you need to follow to help reduce exposure to an adequate level. It is important to follow all the points, or use equally effective measures. Fixed sanding machines (narrow belt)The sheet is part of HSE guidance COSHH essentials: easy steps to control chemicals. It describes the key points you need to follow to help reduce exposure to an adequate level. It is important to follow all the points, or use equally effective measures. Fixed sanding machines (disc)The sheet is part of HSE guidance COSHH essentials: easy steps to control chemicals. It describes the key points you need to follow to help reduce exposure to an adequate level. It is important to follow all the points, or use equally effective measures. Fixed sanding machines (drum/bobbin)The sheet is part of HSE guidance COSHH essentials: easy steps to control chemicals. It describes the key points you need to follow to help reduce exposure to an adequate level. It is important to follow all the points, or use equally effective measures. 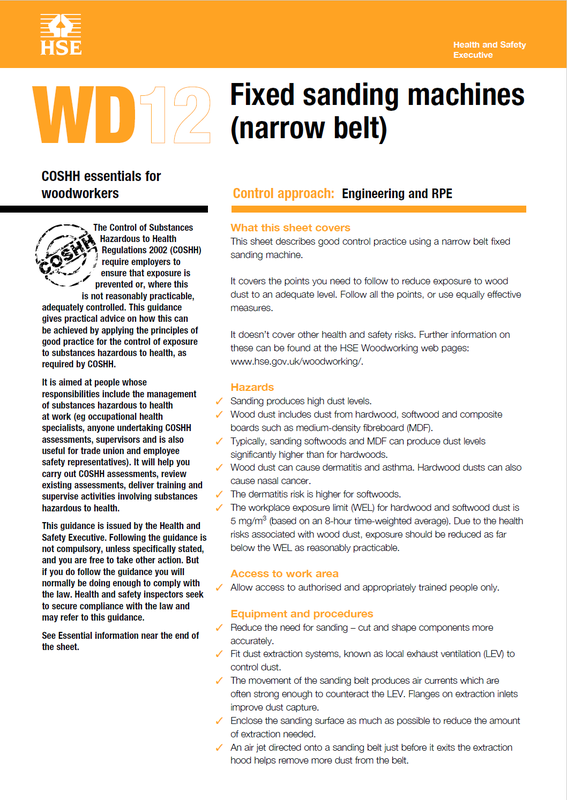 Chop sawThe sheet is part of HSE guidance COSHH essentials: easy steps to control chemicals. It describes the key points you need to follow to help reduce exposure to an adequate level. It is important to follow all the points, or use equally effective measures. Suction hose attachment for cleaningThe sheet is part of HSE guidance COSHH essentials: easy steps to control chemicals. It describes the key points you need to follow to help reduce exposure to an adequate level. It is important to follow all the points, or use equally effective measures.